Providing a simplified approach to determining the effectiveness of your organisation’s compliance management systems against the established global standard. Faced with increasing regulatory requirements and ever growing public scrutiny, organisations across all industries need to be proactive when it comes to maintaining effective compliance management systems. Enter KPMG Compliance Compass, an innovative cloud-based solution that enables rapid self assessment of your organisation. The app provides surveys consisting of a range of questions relating to governance, culture and specific compliance management activities like breach management. 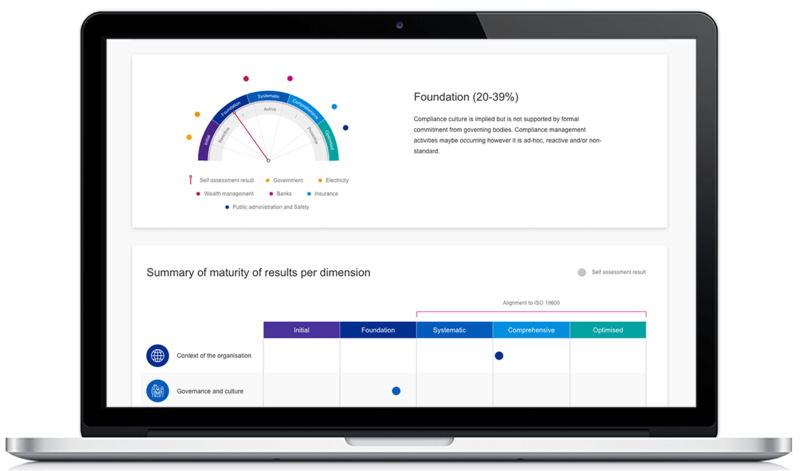 Once completed, KPMG Compliance Compass presents you with a compliance maturity rating for your organisation, as well as your performance across 10 dimensions. By demonstrating that your organisation is taking a proactive approach to compliance management, drive better outcomes for both your business and customers. Standardised, industry-agnostic survey questions make it an excellent solution for organisations big or small, across any industry. Use surveys to consolidate input from all levels of your organisation. Enables year on year comparisons of performance by providing a central data repository to store assessment results. Gain tailored advice on how to achieve your target compliance maturity level with a Compliance Framework Diagnostic. By reviewing self assessment results and conducting an in-depth review of your organisation, KPMG professionals will provide you with strategic recommendations and an action plan on how to improve your organisation's compliance maturity. Some or all of the services described herein are not permissible for KPMG audit clients or their affiliates or related entities. KPMG will use your personal information to process your enquiry for KPMG Compliance Compass. KPMG will also use your personal information to maintain our contacts database, to contact you about KPMG services, events or insights and for other business related purposes. We may disclose this information to our service providers on a confidential basis. You may access or seek correction of the personal information that we hold about you by contacting our Privacy Liaison. For further details on how we handle your personal information, please refer to our Privacy Liaison. Submitting your request also means that you agree to the KPMG terms and conditions. © 2019 KPMG, an Australian partnership and a member firm of the KPMG network of independent member firms affiliated with KPMG International Cooperative (“KPMG International”), a Swiss entity. All rights reserved. The KPMG name and logo are registered trademarks or trademarks of KPMG International. Liability limited by a scheme approved under Professional Standards Legislation. The Digital Services consist of the products and services KPMG has agreed to provide to the corporate entity that you represent (“Your Business”), and include the online platform through which such products and services may be delivered. infringing the intellectual property in any part of the Digital Services. You will maintain the confidentiality and security of your login details and not disclose them to any third party outside of Your Business. As between you and KPMG, any access to and use of the Digital Services made using your login will be deemed to have been completed by you (whether or not authorised by you). You must immediately notify us upon becoming aware of any unauthorised access to, or any security breach in relation to, your login details. In relation to your login details, you acknowledge that KPMG may at any time require you to provide us with further or amended identity information or require different authentication arrangements. For example, KPMG may require you to provide documents and other information requested, procure a certificate of identity from a certification authority chosen by KPMG and/or comply with our identity authentication and management systems. You will comply with KPMG’s security, technology and risk management policies that may be notified to you from time to time. is offensive, inappropriate or would otherwise cause harm. may be used or disclosed in a de-identified form for such business purposes as KPMG, its associated entities and member firms may determine and you consent to such use and disclosure. All existing intellectual property rights subsisting in the Digital Services remain the property of their owner. Access to the Digital Services may be suspended, limited, denied or disabled at any time and any content uploaded by you may not be recoverable. As between you and KPMG, you are responsible for retaining copies of all such content. The Digital Services are not intended to be used for archival purposes. damage due to viruses or other malicious code. Your right to access and use the Digital Services will automatically terminate or expire when Your Business’ rights to the Digital Services terminate or expire under the KPMG Digital Services Terms and Conditions of Business. You may terminate your access to the Digital Services by contacting KPMG.